Before becoming one of the most prolific and acclaimed songwriters in rock history, Doc Pomus was a rock singer who was notable largely for reasons unrelated to his actual singing. Despite his commitment to performing he soon found he was better suited to crafting the work for others and left singing behind. 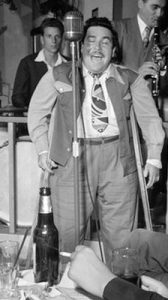 Pomus was born as Jerome Felder in 1925 Brooklyn, New York where he contracted polio as a boy which left him reliant on using crutches while still a young man before eventually landing him in a wheelchair for the rest of his life. Despite this affliction he was determined to make a career for himself as a singer, inspired by his idol Big Joe Turner. But polio wasn’t his only obstacle to success in this realm, for there were no white Jewish rock (or blues) singers in the 1940’s, in fact no white singers at all, and so Pomus drew notoriety initially for those features as much as for his enthusiastic efforts on the bandstand. Yet his devotion to the music was genuine and he befriended many artists and won over audiences in spite of his rather limited vocal abilities, and thus possibly in an attempt to capitalize on the novelty aspect of his story he managed to get signed to record deals. His songs at this point though were rather pedestrian and clichéd, which is unfortunate and surprising considering his later efforts as a songwriter were anything BUT that. Soon giving up performing he went on to a legendary career writing countless hits throughout the 1950’s and 60’s and becoming one of the most beloved behind the scenes figures in rock. After a life that dealt him nothing but bad cards that he somehow turned into winning hands, Pomus finally succumbed to lung cancer at 65 in 1991, a year before his induction to The Rock ‘n’ Roll Hall Of Fame as a non-performer… his first career AS a rock performer now but a footnote in his life’s story and the answer to the trivia question: Who was the first white artist to release a rock ‘n’ roll record.